Sand Dollar Press Inc, 9780983650324, 307pp. Eden Newman must mate before her 18th birthday in six months or she'll be left outside to die in a burning world. But who will pick up her mate-option when she's cursed with white skin and a tragically low mate-rate of 15%? In a post-apocalyptic, totalitarian, underground world where class and beauty are defined by resistance to an overheated environment, Eden's coloring brands her as a member of the lowest class, a weak and ugly Pearl. If only she can mate with a dark-skinned Coal from the ruling class, she'll be safe. Just maybe one Coal sees the Real Eden and will be her salvation her co-worker Jamal has begun secretly dating her. But when Eden unwittingly compromises her father's secret biological experiment, she finds herself in the eye of a storm and thrown into the last area of rainforest, a strange and dangerous land. Eden must fight to save her father, who may be humanity's last hope, while standing up to a powerful beast-man she believes is her enemy, despite her overwhelming attraction. Eden must change to survive but only if she can redefine her ideas of beauty and of love, along with a little help from her adopted aunt Emily Dickinson. Victoria Foyt is well known for her work as a screenwriter, actress, producer of critically acclaimed independent films, including DAjA vu and Last Summer in the Hamptons. She has appeared on major television and radio outlets, at film festivals around the world, and in many magazines, including Vogue, O at Home, and Town and Country. Her debut novel, The Virtual Life of Lexie Diamond (HarperCollins), a young adult (YA) supernatural mystery, received critical acclaim, including a five-star review from TeensReadToo.com. She established Sand Dollar Press in 2011 to promote YA novels through film-quality, online campaigns. 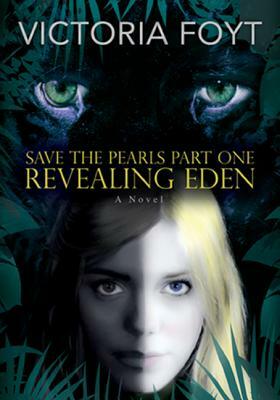 Save the Pearls Part One: Revealing Eden is her first release, tied to an interactive site: SaveThePearls.com, and a newsfeed. Revealing Eden is the runner up in the YA category of the 2011-2012 LOS ANGELES BOOK FESTIVAL! This is an incredibly powerful novel. Eden, the main character, lives in a dystopic world. The sun is no longer effectively blocked by the ozone layer, rendering anyone without adaptations, aka very dark skin, undesirable. Eden is as much of a "Pearl," aka very white, as they come. She knows her mating chances are low and desperately wants to mate with a Coal. She wants to succeed so much that her instincts fail her and she is betrayed by her Coal secret boyfriend. She is saved by one of the most powerful and desired Coals. Her father and her are taken to a safe place so that her father can continue helping the powerful Coal in peace. Eden feels a dangerous attraction Bramford, the Coal who saved her, and doesn't know what to do with her feelings. She fights Bramford every inch of the way. The reader will love to read about their ups and downs and developing relationship. The scenes with Bramford and Eden are filled with tension, the reader will love the suspenseful undercurrent. Can Eden change her perceptions to accept what is real? As a character, Eden is feisty. She is impulsive, brave, and fiery. The reader will never tire of following her "adventures"...even when the reader will feel like shaking Eden and telling her what she should be doing. Bramford is surly himself, but he is also Eden's savior and seems to see the "true Eden." He doesn't give up on her even when she pushes him to his limits. The secondary characters pale in comparison to Bramford and Eden. The events of this book were fast-paced and interesting. The author details the rich environment of the safe place perfectly, the feelings and tone of the novel are clear. This book is highly recommended to young adult/adult readers. Showcasing Victoria Foyt We had the chance to do a lovely interview with Victoria Foyt and get to know her a little. She's going to tell you about her book Revealing Eden and a little about herself....enjoy!! For me, writing became a natural extension of my passion for reading, a way to join the club of authors I so deeply admired. In many ways, they saved me, offering a way to be entertained by the swirling chaos of life. By adolescence, I’d been swept away by Gone With The Wind, Great Expectations, and The Count of Monte Christo, and I dreamed of writing novels. Now, I understand that the authors of those books must have fallen in love with their characters because that is exactly what happens to me. In my new Young Adult fantasy adventure romance, Revealing Eden (Save The Pearls Part One), I tapped into my deep fears about Global Warming and my lifelong questions about true love. I really wanted to know what would love and relationship and even, beauty, look like if an overheated earth turned social standards upside down. This led me to create a post-apocalyptic world in which increased solar radiation has forced mankind to live in tunnels. Caucasians are an oppressed minority, the Pearls, while dark-skinned people are more able to withstand The Heat, and therefore rule. The contrast between this bleak, angry, overly tech-driven world in which love is dead and the interracial romance that flourishes, despite all odds, between Eden Newman, a downtrodden Pearl, and Ronson Bramford, a Coal titan, is unique and inspiring. I feel in love with them, just as they fell in love with each other. Like Eden, I always hoped that someone would love me for my mind, the real me, and not judge me on appearance. It was such a thrill to write her story. Feisty and brave, she also lacks confidence, which often leads her to make poor decisions in relationship with men. Sadly, not unlike me. I started writing Revealing Eden in first person, but my editor suggested I change to third person intimate, which feels like first person because we still see the story through one character’s eyes. She was right; the change helped create the wonderful romantic tension between Eden and Bramford, and made him seem really hot! Sometimes you simply want to shake Eden, which is how I once felt about Scarlett O’Hara! Once I changed the tense, the writing of Revealing Eden just flowed; it took me about two and a half years. I was excited each day to get to my studio and see what would happen next. If I’m lucky, the characters act out the story for me, and Eden and Bramford were great actors! It was much easier to simply take dictation from them than slavishly follow my outline. I can’t listen to music or be distracted by the Internet or phone calls because watching and listening requires all of my concentration. I think it would be way too hard to write it by myself. And while I may have been alone at my computer, talented actors surrounded me when we shot a dozen videos for SaveThePearls.com, an interactive site about Eden’s world. It was amazing to watch “Eden” come to life and act out scenes in the book. As a filmmaker and a novelist, the creation of her world online provided a fantastic opportunity for me to use all of my experience and skills. I want to thank all of you who have uploaded your videos to the site, and who have contacted me at VictoriaFoyt.com or http://www.facebook.com/SaveThePearls. I love hearing from you! And a huge thank you to all the bloggers who have requested a copy of the book and also written about it. The passionate community of readers you are creating both amazes and inspires me. What inspires you to write?A burning question usually inspires me, what if? In Revealing Eden (Save The Pearls Part One): what would happen if global warming turned today’s prevailing beauty standards upside down? In the story, because Caucasians have less melanin in their skin to protect them from the sun’s burning rays, they are branded as inferior Pearls. Dark-skinned people, or Coals, have more resistance to the Heat, and therefore, now rule society. Eden Newman, a lithe blue-eyed blonde, would be considered gorgeous in our day, while in the future she has to beg for a mate or suffer an early death. The direction in which my “what if” question took me greatly surprised me, as it often does. How old were you when your first novel was published?In my forties, that’s all I’ll say. Looking back, I see that the seemingly circuitous path I took from studying foreign languages and literature in college, to acting and screenwriting and directing afterwards, all provided key tools I would need as a novelist. Meanwhile, I was accumulating invaluable life experiences and insights, which gives a writer his or her unique “voice.” By the time I started my first novel in my thirties, my words flew onto the page, and I haven’t stopped since. Which films did you co-wrote?Several indie films, all of which were directed by Henry Jaglom: Babyfever; Last Summer In the Hamptons, Festival In Cannes, Going Shopping and Déjà vu, which is my favorite, and has become somewhat of a cult classic. My work as a screenwriter definitely improved my sense of dialogue and place. It also added a distinctive visual orientation to my writing. Which have you starred in?All of the above, except for Festival In Cannes. At the time it went into production, I was busy writing a novel and had to turn down the starring part. It was a tough decision, but finally, I needed to commit to my heart’s desire, which I’m glad I did. What's your favorite Bath and Body Works scent?I love Warm Vanilla Sugar—both seductive and comforting. I discovered it years ago at their shop in the charming city of La Jolla and couldn’t resist it. What is Revealing Eden about?REVEALING EDEN (Save The Pearls Part One) is a fantasy sci-fi adventure romance that, to my amazement, fulfills all of the requirements of each genre and yet, is a unique page-turner. I didn’t set out with such lofty goals, I simply had to tell Eden’s story, which in truth, is a pastiche of my own fears and dreams. Doomed unless she mates soon, Eden Newman, a white Pearl, hopes a Coal from the dark-skinned ruling class will save her. But when she unwittingly compromises her father’s secret biological experiment, perhaps mankind’s only hope, Eden is cast out—into the last patch of rainforest and also the arms of a powerful beast-man she believes is her enemy, despite her overwhelming attraction to him. To survive, Eden must change—but only if she can redefine her ideas of beauty—and of love. Which was your favorite magazine to be in?I was thrilled when my publicist announced that I was going to be in Vogue! I immediately decided to lose 5 pounds, but I was in Italy at the time. Who can diet there? I fretted about what to wear and was very relieved when I learned that the magazine’s stylist would bring a selection of clothes. Great, as long as they didn’t bring bathing suits, I joked. The day came and two lovely stylists arrived at my house with several wardrobe trunks. I watched with great anticipation as the women unpacked the items, setting out Louboutin shoes, which had just started to become popular, accessories, and then, oh no—a rack full of bathing suits! I stared dumbfounded at the skimpy suits. It was a mistake. Didn’t they know I’d had two kids? I hadn’t prepared anything else to wear and, near tears, began frantically to root through my closet. Finally, the editor and I pulled together something simple that, in the end, reflected my style best. It was so much fun. Who was your favorite talk show host? Why?I adore Oprah! She’s so authentic and powerful. She radiates real beauty. I praise her efforts at encouraging reading. And I admire her motto: “live your best life”, which isn’t about competition, but being true to yourself. When I wrote an article for her magazine, O at Home, the efficiency, professionalism, and positive nature of her staff impressed me, and seemed to reflect Oprah’s great qualities. Can you describe Lexie Diamond?Lexie Diamond believes that cyberspace is the key to a realer reality than the so-called real world, or “Bubble,” in which everyone else is trapped. She has a hard time understanding why people don’t see how fake their lives are, or why their “Monitor A” type speech clearly doesn’t match the subtext she “hears” on “Monitor B” Disaffected and socially inept, she finds solace in her alter-ego, a computer she names Ajna-Mac (ajna is the Sanskrit word for third eye.) Then a tragic accident rocks Lexie’s cyber-driven world and forces her to navigate the real world. With the help of an unexpected ally—her first actual friend—not only is Lexie drawn in a mystery surrounding the accident, but she discovers more magic in the Web that she ever dreamed possible. Along the way, her beliefs are challenged, her family is turned upside down, and her future is threatened. Finally, Lexie must decide what is real and what is virtual. Do you have more of an East-Coast style or more of a West-Coast style?My style is more tropical, an island mentality. I grew up in Coral Gables, a suburb of Miami, just off Biscayne Bay, and spent my days swimming in warm water, often eating lobsters that my brothers caught off of our dock. That sense of freedom and oneness with nature has never left me. Even in the midst of intense production or social activity, I can tap into a wellspring of inner peace that I discovered when sailing on calm seas. Which book was the most fun to write?REVEALING EDEN (Save The Pearls Part One) was a thrill to write. One of the great gifts of being a writer is what your characters reveal about yourself. Eden Newman, the seventeen-year-old protagonist, uses her head, not her heart, to navigate the world. I definitely have had to work at opening my heart and, like her, to stop judging myself based on my appearance. I loved watching Eden transform from this oppressed, frightened girl to someone who is willing to embrace her strength, her inner beauty and even, true love. And then, I really enjoyed creating her surly love interest, beastly Bramford, who turned out to be so hot! Which character from any movie, or any book, or any television show are you most like and why?I’ve always identified with Lucy from the Peanuts comic strip. She is slightly out of touch with social cues and clearly in need of some TLC. Is there anything else you'd like to say?I love to hear from readers! Please visit me at VictoriaFoyt.com or at facebook.com/VictoriaFoyt. And thanks for all the cool videos you’ve uploaded at SaveThePearls.com. You make it all worthwhile. So, first let’s get those typical questions out of the way…I’m sure you’ve been asked a million times, but, hey, inquiring minds want to know! Tell us a little about your personal life? Married? Children? Furry Children? Hobbies? My children are no longer furry, alas. My daughter is a sophomore at NYU film school, my son a budding thespian in high school. I feel so grateful to be their mom; it’s an extraordinary journey. I live with another artist, a very talented sculptor, who understands why I disappear into my studio for long hours and my passion for writing. Like the romantic hero of Revealing Eden, he’s beastly, in a good way. In fact, I dedicated the book to him! Hobbies—who has time? Reading is my favorite pastime, at least two books a month. And after sitting at my computer for long stretches, I like to exercise, mainly walking along the seaside bluffs or playing tennis. I’m hoping to learn to sail as soon as I finish the third book in the Save The Pearls series. When did you first realize that you wanted to be a writer, and what was the first thing you remember writing? I always wanted to be a writer; I couldn’t not write. I wrote a lot of poetry in high school, a practice I returned to whenever my heart was broken. One in particular, a sonnet, was my favorite, and I’ve included it in a novel that I’ve been working on for a while. Later, I wrote screenplays, which were turned into indie movies: Déjà Vu, Last Summer in The Hamptons, Babyfever, Going Shopping, Festival In Cannes. Of all the forms of writing, novels satisfy me the most. Who were your favorite authors growing up, and who are your favorite authors now? As a youngster, I tended to read the classics, perhaps because that’s what I found on my parents’ bookshelves: Margaret Mitchell, Hemingway, Fitzgerald, Dickens, Dumas, Nabokov, Dostoyevsky. Heady, great stuff! In college, as a foreign language major, I fell in love with Cervantes, Lorca, Camus. Now, my favorite authors include Jane Austen, or course, and Isabel Allende, Gabriel Garcia Marquez, Jeffrey Eugenides, and the languorous Haruki Murakami. To me, each great book is like a small, exciting master class in writing. In Revealing Eden, people are given “mate rates” – the darker their skin color, along with wealth and social status, the higher the mate rate. Tell us what celebrity (real or fictional) would get the highest mate rate from you and why. What a great question! Actually, I modeled Ronson Bramford on Sir Richard Branson, the head of Virgin, who funds visionary research in air and space exploration. I figured that if he were faced with a similar situation on Earth that caused people to die from the extreme solar radiation, he might develop a technology to save the world. Of course, like Eden, Branson’s white skin would brand him a Pearl with a low mate-rate. The highest rating might go to someone like Jay-Z, who is young, rich and dark. Eden’s father combines the DNA of 3 animals to alter Bramford’s DNA in an experiment to make him a more “superior” species. If you could do this to yourself, which animals would you choose and why? Perhaps, like Eden’s father, I would take something from the same three great predators—the jaguar, harpy eagle, and anaconda—which would give me an edge on land, water and air. In Bramford’s case, the primary donor is the black jaguar, and I would choose the same. However, I would go for the more familiar russet-coloring. Love that print! Can you tell us anything about the next book? Gladly. In Adapting Eden (Save The Pearls Part Two), the past comes back to haunt Eden Newman. If she thought life and love challenged her in Revealing Eden, the stakes ratchet even higher in the next book. She must fight to save those she loves against impossible odds, testing herself beyond her limits—in love and physical strength—while the countdown to humanity’s extinction continues. I’ll tell you, being in her head is a wild, exciting ride! Overall, her journey takes her from oppressed, fearful girl to an alpha babe, or Jaguar Babe. It is Valentine’s Day – do you have any special plans? My boyfriend and I are going out to dinner at a local Italian restaurant I love. That sounds so prosaic, but now that I have love in my life I really enjoy all those silly rituals I once disdained. I’m sure we’ll find something inventive to do afterwards! Despite my intense love affair with chocolate, I prefer coffee flavored ice cream. Although in Italy, I had a pistachio gelato that was out of this world. Any weird obsessions or quirks? Tons, but I wouldn’t reveal most. I can tell you I would make a lousy vampire. I love to rise at the crack of dawn. Everything about the morning delights me: the quiet freshness, a feeling of renewal, and the first slant of daylight give me a powerful feeling. Also, because of my acute memory, I get bored watching the same movie twice so immortality would be a drag. I’ve given up my guilt over my love for dark chocolate. I don’t care whether or not it’s good for me, or fattening, or whatever. It gets me through the day. Thanks for your interest. By the way, I love to hear from readers. Please visit me at VictoriaFoyt.com or at Facebook.com/VictoriaFoyt and check out the awesome, dynamic interactive site SavethePearls.com or on Facebook.com/SaveThePearls. You make it all worthwhile. And seriously, guys, Revealing Eden:Save the Pearls was an awesome book! 1~ Tell us a little about yourself? I’m both deeply analytical and highly creative. Fortunately, since writing is such a solitary pursuit, I’m a homebody. However,I have traveled quite a lot and lived in Europe during my junior year in college. I had a double major in French and Spanish, so I split the year between France and Spain. I love languages, words, reading—communicating ideas and story. After college, I moved to Los Angeles and began studying acting and writing screenplays. This honed my use of dialogue,location and story structure. I was lucky toco-write and star in several indie films: Déjà vu, Last Summer in the Hamptons, Going Shopping, and Babyfever. Now, I live in the pretty coastal town of Santa Monica where I have raised two teenagers. I write every morning, nearly seven days a week. When I’m not writing or managing my business, I love to play tennisand spend time with my family and friends. 2~ Tell us please, what's a typical writing day like for you? The timeworn cliché of a slovenly, drunken writer is 180 degrees opposite from my approach. To me, being a writer requires an almost athletic discipline: clean body, sharp mind, and an open heart. At breakfast, I usually read The New York Times because invariably, I’ll find something to use in my writing, even if it’s only a word. Around 8:00 a.m., I head to my office with a big mug of coffee in hand. There, I meditate to clear my mind. Typically, I set a goal of how many pages I hope to write or edit, depending on where I am in the story. I usually quit by mid-afternoon to attend to phone calls and business. Later, I try to exercise because sitting for so long is hard on the body. And most importantly, I aim for a good night’s sleep so my mind is fresh when I begin again the next day. 3~ Do you have any writing quirks? Probably more than I realize! I’m very strict about starting to write at the same time. If I manage it, the writing flows. If not, it can be more work than play. It’s as if my muse is conditioned to show up at a certain hour,and punishes me whenever I’m late. 4~ Have you always wanted to be an author? I always wanted to be a writer; I couldn’tnot write. I wrote a lot of poetry in high school, a practice I returned to whenever my heart broke. I have a lot of poems in a drawer! Of all the forms of writing, a novel satisfies me most. It combines my love of language, story and theme. And it is the thing I most dreamed of doing when I was a young girl. 5~ What authors do you admire? The list of writers whom I admire and who have influenced me is long and varied. I have always been an enthusiastic reader of all kinds of books from romances by Jane Austen and mysteries by Raymond Chandler, to biting social commentary such as Aravind Adiga’s The White Tiger or Lois Lowry’s The Giver. As a teenager, I devoured Ernest Hemingway’s books, and have recently reread many of them. His direct prose and elegant storytelling definitely set the bar. On the other end of the spectrum, I adore Isabel Allende’s lush, more feminine prose and quixotic stories. One of my favorite books is the heartbreaking Love in the Time of Choleraby Gabriel Garcia Marquez. From each writer I have found the courage to find my own voice. 6~What inspired you to write "Revealing Eden"? Usually a big “what if” question leads to a story, and this certainly was the case withRevealing Eden. I wondered what would happen if global warming turned today’s prevailing beauty standards upside down. In the story, the loss of the ozone layer has increased solar radiation to deadly levels.Since Caucasians have less melanin in their skin to protect them from radiation, they have largely died off. The remaining white population is branded as inferior Pearls. Dark-skinned people, or Coals, have more resistance to the Heat, and therefore, now rule society. Eden Newman, a lithe blue-eyed blonde, would be considered gorgeous in our day, while in the future she has to beg for a mate or suffer an early death. The direction in which my wonderings took me greatly surprised me, as it often does. 7~ Let's say your book is being made into a movie, do you already have actors in mind you would want cast? What bands/singers would you want on the soundtrack? So many readers have commented on what agreat movie Revealing Eden would make that I began to wonder about the casting. I think Elle Fanning would be awesome as Eden Newman. She looks just like her, is the right age, and what a terrific actress. I haven’t come up with anyone for Bramford. If you or your readers have any ideas, I’d love to hear them. 8~ What are the first three things that instantly pop into your mind when you think of "Revealing Eden"? 9~ Being that Valentine's is a day of love and romance, could please you share a bit insight to the relationship of the characters or perhaps even a snippet? Eden Newman, an oppressed Pearl with a low mate-rate, feels inferior to her Coal boss, the handsome titan, Bramford. When she unwittingly messes up a secret experiment he has funded, which just may save mankind, they are tossed into the last patch of rainforest. In this strange,dangerous world, they must rediscoverthemselves, and each other. Their preconceived opinions get in the way, but ultimately, as trust grows and they reveal their secrets, love blooms. The forest sounds dropped away, replaced by the rapid pounding of her heart. Eden forgot the passing scenery and their destination. Only the hot press of his hands on her bare skin, the tilt of his head brushing her inner leg, and her burning ache consumed her. The more pleasure she experienced, the bolder his touch grew. Now his hand trailed up and down the whole of her leg. She dared to test the boundaries of their body language and flexed her thighs around his neck. Unbelievably, his gait slowed. A feverish thrill shot through Eden. She could guide Bramford with a mere squeeze. Did she dare push him further? She couldn’t resist the wild urge to flick her hips against his shoulders. At once he picked up speed. She almost squealed—his raw animal power was at her command. 10~ I can tell you I'm a bit anxious already for "Save The Pearls : Part two, Adapting Eden". Is there anything you can share with us about what's coming up next? At first, the idea of writing a sequel daunted me. As soon as I started, however, the next phase of Eden’s journey from an oppressed, fearful girl to an alpha babe, or Jaguar Babe, captivated me. In Adapting Eden (Save The Pearls Part Two), the past comes back to haunt Eden Newman. If she thought life and love challenged her in Revealing Eden, the stakes ratchet even higher in the next book. She must fight to save those she loves against impossible odds, testing herself beyond her limits—in love and physical strength—while the countdown to humanity’s extinction continues. I’ll tell you, being in her beastly head is a wild, exciting ride! Are you ready for some quick fun? Choose one answer questions? Coke or Pepsi? Diet coke with a slice of lemon, very little ice. McDonald's or Burger King? Just fries, either one. Chocolate, Vanilla, or Strawberry? Major chocolate addiction! Paranormal or Historical when reading? Paranormal. Kit-Kats or Peanut Butter Snickers? Yum, Kit-Kats. Casual dress or formal attire? Casual, kind of preppy. I would like to take the time to say thank you again for being on the blog today! Is there anything you would like to say to your fans? I love to hear from you! You make it all worthwhile. Please visit me at VictoriaFoyt.com or at Facebook.com/VictoriaFoyt. And check out Eden Newman’s videos on the interactive site: SaveThePearls.com! I think you’ll be amazed. Thanks so much for your time. your time. The plot is very different than anything I have ever read, it is very unique. It is set in a time where the darker your skin, the higher your social status. Eden is a "pearl" (Caucasian) and covers her skin with brown gunk to make herself appear darker, but she still doesn't get treated fairly by the "coals" (darker skinned people). It is an example of race inequality, and how some people still feel like they are superior to another race and that was sad to see. An interesting part of the story is that if Eden doesn't find a "mate" before her 18th birthday, she will be set out in the sun to die. How can people do that to someone? That's crazy. The setting was completely different than anything I have read. The sun being a killer? I can't imagine a world without the sun, that would be so crazy! The world Eden lives in was very technologically advanced. Eden wore headgear, that allows you to mentally see any place and time, that would be so cool! It would also be a great escape for Eden and an entertaining tool. The whole setting was awesome, from the jungle and the compound where Eden lived, hidden from the sun and the way it was described was phenomenal. The romance aspect was something I didn't exactly believe at first. I thought Bramford was a jerk, he was. But after a while I could see why Eden was attracted to him. The tension kept building between the two and it was like, why can't they just make out already? It is bound to happen. At the end of the book, I wanted more, and can't wait to see what happens next! Revealing Eden was a exciting and original, I can't wait for Part 2! What would happen if global warming continued to the point where resistance to deadly solar radiation determined class and beauty? This is the future we encounter in Victoria Foyt's captivating new novel, (Save The Pearls Part One) Revealing Eden (Sand Dollar Press, Inc.). In this world, the darkest skinned people (the Coals) are prized and can survive much better than the fair-skinned (Pearls). Pearls are considered undesirable and go to great lengths to be more acceptable by covering their white skin with dark make-up. Our heroine, Eden Newman, is 17 and running out of time. She is a Pearl and if no one picks up her mating option by her 18th birthday, she will be sent outside to die. Her father is a scientist working for a wealthy, charismatic Coal named Ronson Bramford. Bramford believes that Dr. Newman has developed the technology to save mankind by producing a super-being who can withstand the deadly environment and thrive. Eden is working in the lab when we meet her. Her mother has died and she is not very close to her father as he is consumed with his work. She desperately hopes a Coal, named Jamal, who seems to be very interested in her, will pick up her mating option before it is too late. What happens next is page-turning suspense when Eden unwittingly compromises her father's experiment and is forced to escape with Bramford and her father to the last patch of rainforest. There, the love story between Eden and Bramford turns unexpectedly as each is surprised by the other's true character, neither living up to built-in prejudices, even about their own kind. Eden is smart, funny, feisty and fearless. Ronson Bramford is her Rhett Butler and we watch them fight and fall in love all while they deal with "The Heat," humanity's probable demise, and the experiment that may allow humans to adapt. While reading this I felt like I was watching an Avatar type film. It's very visual and futuristic with a tender love story at its core. Foyt covers interracial issues, what beauty means culturally, and environmental destruction, all while entertaining the reader with one twist after the next. Although the book is young adult/fantasy/sci-fi/romance, I, as an adult who mostly reads non-fiction, loved it! Revealing Eden was a very interesting read. It is different than anything else I have read. I love apocalyptic stories and this novel has a great visual feel of underground tunnels and people having their entire lives influenced by computers and holographic images. The people in this book is divided into two groups. The group that was the minority in the old world is now the ruling majority. Coals vs Pearls. At first this aspect gave me pause. Because pearls and coals are just synonyms for whites and blacks. In this story black people (Coals) rule the world and white people (Pearls) are becoming extinct because no one wants to mate with the lowest class citizens. It is a very interesting idea but to me there is so much racial prejudice today that it seemed strange to base a futuristic novel on this same premise. However, as the story progressed and a shift occurred from the community life to the more secluded jungle life. It became possible for the different races to push boundaries and develop connections. This was my favorite part of the novel. It became less about hate and more about accepting who you are and appreciating the unexpected beauty in others. Revealing Eden is a very unique novel and I believe that anyone who reads it would be captivated and drawn into this new world that is similar yet strangely different from ours. I can't wait for Save the Pearls Part Two ADAPTING EDEN to come out. It also sounds great. What I should mention first about this read is that the description of the settings was absolutely lovely. Different parts of the book are in different settings and it was a brilliant contrast between one and the other - complete opposites that got me really feeling like I was there. I must admit I found it hard to like the protagonist, Eden, at first. She really got on my nerves but I found she grew on me the more she developed throughout the story. As events unfolded she made better decisions so I ended up really liking her towards the end. Let's talk about Bramford for a minute though. Wow. He's made of hot stuff let me tell you! I really loved his character and how underestimated he was for literally three quarters of the book. I didn't fully understand his intentions until right towards the end of the book and I think that's the way it was meant to be. He was a brilliant character - full of depth and passion. What let me down though was that the book only seemed to start to get going towards the end. The last quarter was where it started to get really exciting and things were brought to light. I think what kept me reading was little tidbits of interesting clues here and there to make me wonder what was going on. It was worthwhile towards the end though because when everything came together it all made perfect sense even though I was no way near close to guessing what was going to happen! Overall this is a very quick and easy read full of great characters - some of them more charming than others - and a lot of action. I do recommend it and I'm certainly looking forward to the next book in the series! help from her "adopted aunt" Emily Dickinson. I saw this one first on Twitter. They started following me and so I investigated to see who they were. I don't blindly follow. I went to the website which I found very bizarre, but I couldn't look away. I kept watching this lovely blond haired, pale girl get increasingly dark skinned and dark haired. She looked ridiculous. But the things she was saying were even more so. Then I clicked to another part of the site and there was a part that was like a matchmaker site. Again I couldn't look away. I finally left after reading the premise of the book, but still not sure what I'd seen. Then the book became available on NetGalley and I knew I had to read it. In a reverse discrimination scenario, "The Pearls, "fair skinned, blond haired people, are looked at as inferior because they cannot withstand the harshness of the world outside of the caves that everyone lives in. The melanin in the "Coals" skin protects them and makes them valued. It's an apocalyptic and dystopian society. If a Pearl hasn't been mated by the age of 18, their life resources are cut off and they either perish out in the heat and harsh sun or die inside without food or oxy- some type of drug the government rations out to everyone I suppose to keep peace and keep them from feeling claustrophobic living in a cave basically. Eden and her mother used to make up relatives since they didn't have any before the last generation. The rest had died in the Meltdown and most of the Pearls had died then. What few were left were easily outruled by the Coals who survived the Meltdown better due to their darker skin. First problem, the Great Meltdown isn't really explained. Did people destroy it through war? Nuclear perhaps? Did the ozone layer completely burn off and no one could survive the temperatures? But it sounds like something catastrophic happened. At least that's what it sounds like. Like all of the sudden thousands died in an instant. And then Pearls, even though they live underground are more likely to die by The Heat. That too, is not explained. Nuclear sickness? But only Pearls wouldn't be affected. Skin Cancer? Possibly. But then you'd expect they'd have medicine for that. We treat it now. Anyway, that isn't explained either. So, Eden and her red headed, pale skinned mother make up relatives, one of them being Emily Dickinson. They read her poems and memorize them. She becomes so believable as a relative that even after her mother dies of The Heat, Eden refers to her as Aunt Emily and looks to her poems for guidance. And Eden has a problem. A negligent father, a Pearl who is allowed to live because of his scientific knowledge. who is working on a top secret project for the rich, arrogant and angry Ronson Bramford. Eden has one hope, one prospect in a soldier for picking up her mating option. But in one night everything goes terribly wrong and she finds herself with the one man she can't stand the most, her father dying and worst of all on the run topside to the borderlands. They end up in the rain forest, the last remaining rain forest and it's there that Eden learns about life, real life. This was a a real page turner. There was constant action, a bit of reflection and a lot of stupidity on the part of Eden. She can't see what's right in front of her for what she's left behind and what she left behind was sure death. Eden is one of those characters that you want to yell, "Don't go into the basement," when you're watching a slasher movie because you know that's where he's waiting for her. Same with Eden, but it's don't do that, don't say that, don't go there, Dear Lord, please don't go there. She thinks she's Xena Warrior Princess, but she's more like Alice in Wonderland. And she upsets everything. She causes a lot of problems and for being someone that has been continuously looked down upon for her skin color, she's got quite a bit of growing up to do regarding prejudice. I did find the little inserts of Emily Dickinson's poetry though, interesting. Here are the immortal words of a 19th century poet being used as inspiration and guidance for a 17 yr old girl in whatever year it is but many centuries in the future. Ronson Bramford is the romantic lead and is very enigmatic both in his pre and post state. I can't say more than that or it will give too much away. But he is drawn to Eden for all the wrong reasons and all the right ones. But because of this, there is this constant war within himself and he brings her close then pushes her away. It might have happened once too many times for me. But he does save her life more than once, one in a spectacular fight with an animal I've never read about a person fighting. It felt incredibly real. Details. There were lots of details about life in the compound or cave or wherever it was Eden lived before. But the better part was when they lived in the rain forest. There was always a new bird or flower or something. Some new experience for Eden since she'd only experienced any of this through a sensory band that showed a kind of hologram. This was real. Maybe that's why she didn't understand the dangers of what she did when she made stupid choices. But it was like a kid on Christmas morning and I found it very interesting to read about. Especially as I doubt I'll ever be visiting the Rain forest. The unexpected ending was amazing. I felt doom and really didn't want the story to end the way it seemed destined to end. And what's more, there will be a second story. In all, if you can overlook the lack of explanations, which I easily did, and stop wishing you could slap Eden, this is a really enjoyable story about the future of how mankind might survive. In a post-apocalyptic world, everyone must live underground to protect themselves from the extreme heat on Earth. People with white skin, called Pearls, are the most susceptible to die from The Heat, and most have already perished. Eden, a Pearl herself, has managed to survive with her father, an intelligent scientist. They now live underground surrounded by a population of dark-skinned people called Coals. Eden's light skin forces her to be in the lowest class, being looked down upon by the powerful Coals. There's only one way for her to earn respect from them, and that's by mating before she turns eighteen. With just half a year left, Eden must find a man that will accept her as a Pearl, or be left stranded on the surface of Earth alone to die. Meanwhile, Eden's father has been working on a secret biological experiment that could save the existing Pearls. But when the experiment is put into the wrong hands, Eden must flee with her father and boss, Bramford, above ground and into a whole new world. There were so many great and wonderful things about this book, it's hard to find a place to start! First of all, the entire story itself was brilliantly thought out and creative. It was really interesting reading about a super high-tech setting underground, where the people dwelled. Sure, it was very farfetched, but that's what made it fun. Also, even though the setting itself wasn't realistic, the people that made up the community living there sure were. Right away, I liked Eden's character. She was independent, open-minded, brave, and rebellious. I admired how she marched to the beat of her own drum, and refused to just deal with the rules given to her. She was also flawed, which made her character seem that much more real! She whined and complained some, ached to fit in and belong among the Coals, and like any girl does, yearned to be loved by a mate. Another unique thing about this book was how the concept of racism was turned around. It was interesting seeing how people with white skin were in the lowest class and treated like scum, while those with very dark skin were superior and ruled over everyone. Something I would have liked to know that was never mentioned in the book was how the surface of the Earth grew so overheated that it began killing off people. The Heat, which was the deadly disease that white-skinned people got, was described as like an extreme sunburn that after a few days lead to sickness and then eventually death. I would have liked to know the background behind all that. The only thing that felt a little awkward sometimes in the story was the relationship between Eden and Bramford. Sometimes it felt forced or unnatural, and the romance wasn't completely believable. There were a lot of unexpected things that happened in the book that I never saw coming. I liked how it was unpredictable and full of action. This was a great book to the start of a new unique series. Cover Thoughts: I really love this cover art! It captures the whole essence of the book, and I absolutely love how the girl's face is half light and half dark. All I can say is this was Crazy-Good!! Revealing Eden has so much going on that my head was spinning with delight! Victoria Foyt did an amazing job of creating a dystopian world unlike anything I've read. A world destroyed by the sun and the majority of people are dark skinned (Coals) and they are the top of the class. While people that are pale skinned (Pearls) are the lowest class and hold no authority or power. Each person must be mated by their 18th birthday or cut off from all resources and thrown out into the world to burn. And Eden is running out of time because not only is she almost 18, but shes a Pearl and would rather die then mate with another pearl. She's desperate to mate with a Coal and just when things seem to be falling into place, everything is thrown into chaos and Eden's world is ripped apart. Shes thrown into the jungle with her scientist-dad and his latest experiment Bramford, a beast-man. His genetics have been altered with animals-- I found all of it super fascinating and I couldn't help but think of what animal traits I wouldn't mind having! While Eden is struggling to adapt without her life-band she also struggling against her growing attraction to Bramford. All shes ever wanted was for someone to see her, the real Eden and she thinks she finally found that in him-- And I about freaked! I was way thrown off and was like seriously girl, what are you thinking?! Half man/half jaguar, really?? But by the end you could just feel the spark between them, like it was flying right off the page! I just had to give in and hope that they would find a way to be together! Crazy, right? Yup, like I said Crazy-Good!! I can't wait to see where Eden and this whole series will go from here! Definitely an engrossing read with the perfect touch of action, romance and Emily Dickerson throughout! In un mondo post-apocalittico dove la resistenza all'ambiente sovrariscaldato definisce la classe sociale e la bellezza, la pelle bianca colloca Eden Newman nella classe sociale più bassa, rendendola una Perla debola e brutta. L'orologio sta correndo: se Eden non si accoppia prima del suo diciottesimo compleanno, verrà lasciata all'esterno a morire. Soltanto se un Carbone dalla pelle scura e della classe dominante la scegliesse come compagna, lei sarebbe salva. Ma non importa quanto Eden scurisca i suoi capelli e la sua pelle, rimarrà sempre una Perla, sempre brutta - dannata da un tragico livello di accoppiamento del 15%. Ma, forse, un Carbone vede la Vera Eden e la salverà. Infatti ha iniziato a vedersi di nascosto con il suo bel collega di lavoro Jamal. Ma quando Eden, senza volerlo, compromette l'esperimento biologico top secret del padre viene travolta dall'occhio del ciclone e gettata nell'ultima zona rimanente della Foresta Pluviale, una terra strana e pericolosa. Eden dovrà combattere per salvare il padre, che potrebbe essere l'ultima sperenza per l'umanità, tenendo testa a un potente mix di uomo-bestia, che lei crede sia suo nemico, nonostante la potente attrazione che li lega. Per sopravvivere, Eden dovrà cambiare, ma potrà farlo soltanto se riuscirà a ridefinire le sue idee di bellezza e vero amore. Victoria Foyt unisce in parti uguali suspence e filosofia, avventura e romance in questo nuovo romanzo ambientato in un futuro terrificante ma fin troppo semplice da immaginare. Non ho parole, veramente eccezionale. Le scene che descrive la Foyt sono talmente reali, ho avuto flesh dell'america degli anni '20 e del razzismo contro i negri. Eden è tutto quello che una ragazza dei nostri giorni vorrebbe essere: flessuosa, intelligentissima, occhi celesti, lunghi capelli biondi, lineamenti cesellati. Eppure, nel suo tempo, è considerata bruttissima, perchè a causa del suo colorito è più sensibile al calore e destinata a morire giovane, quindi reputata poco idonea a riprodursi e a passare i suoi geni alla generazione futura. In questo mondo le razze con la maggiore pigmentazione sono quelle che dominano, perchè più resistenti e longeve. Mentre il suo diciottesimo compleanno, e la sua data di scadenza, si avvicinano sempre di più Eden inzia a sentire i primi segni della disperazione. Ho trovato veramente eccezionale il parallelo fra il cambio di "colorazione" di Eden, da "dipinta" a "naturale", da scura a bionda, con la sua corrispondente e graduale prese di coscienza e cambiamento interiore, una degna manifestazione "fisica" dello stato psichico. Tutti i personaggi sono magnifici, profondamente caratterizzati dal punto psicologico, la trama è innovativa e interessante, la scrittura scorrevole e arricchita da frequenti citazioni alla poesia di Emily Dickinson; insomma è un libro che non sono riuscita a mettere giù fino alla parola fine, nonostante la mia famosa avversione al genere YA. Altamente raccomandato, non fatevolo scappare! Si ringraziano NetGalley e Sand Dollar Press Inc. per la gentile preview. The Good: I loved that Foyt flipped an old idea and turned into something new and fresh. Eden who is a "Pearl" (she is white) and everyone hates the Pearls. Her only chance at making it in this dystopian world of hers is if she mates with a "Coal" (someone who is black). This is the first time I've read a novel that switches that dynamic. Instead of the normal historical stories I read about oppressed black people, this book propels them as the most powerful people in this society. I think Foyt did this wonderfully! I liked that their were some realistic aspects to the story as well as the fantastical. It took me awhile, but Eden, the main character eventually grew on me. I thought the romance was done well and I can't wait for Part Two to come out! The Bad: While Eden did grow on me, in the beginning she was a bit annoying and whiny. Some of her inner monologue got a bit lengthy and unnecessary. I also am still on the fence about Bramford...just not sure what I think about his whole one-minute-I'm-nice-then-the-next-I'm-not kind of attitude. To be honest, this book was pretty odd, but it worked. In Eden's world, people with the darkest skin color are considered beautiful while the paler people are the outcasts. Even though it's so different compared to our culture today, I feel like this could really happen. The way the book presented the setting made it seem very plausible, as if this could one day happen to us if we don't stop messing with the environment. I really liked how it was different yet not extremely outlandish to be completely unbelievable. The setting was really one of my favorite elements of the book. The pacing was awesome. It didn't take a long time to get exciting, even with all the explanations of Eden's world. There wasn't much downtime, and it really kept me on the edge of my seat wondering what was going to happen next.